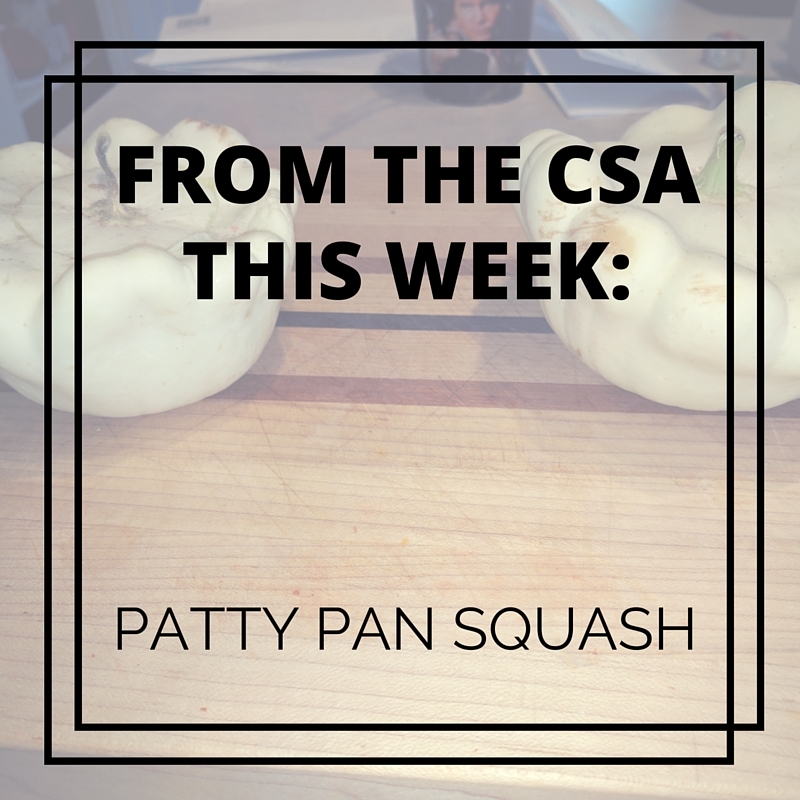 Patty Pan squash, another puzzler from the CSA share this week. I've only ever seen this squash used in holiday displays, never actually eaten so I wasn't really sure what I would get when I cut it open. Would it be soft and seed-y inside like summer squash or have a concentrated core of seeds with firm flesh like a pumpkin? Turns out, it was somewhere in the middle. They do have a cluster of seeds that are easy to remove but the flesh is softer than that of winter squash. It also held up better when cooked and absorbed the flavor of the food than a summer squash. We received three of these with our share and I cooked them two different ways. One I seeded, peeled, and cut into small pieces to use in a burrito recipe. 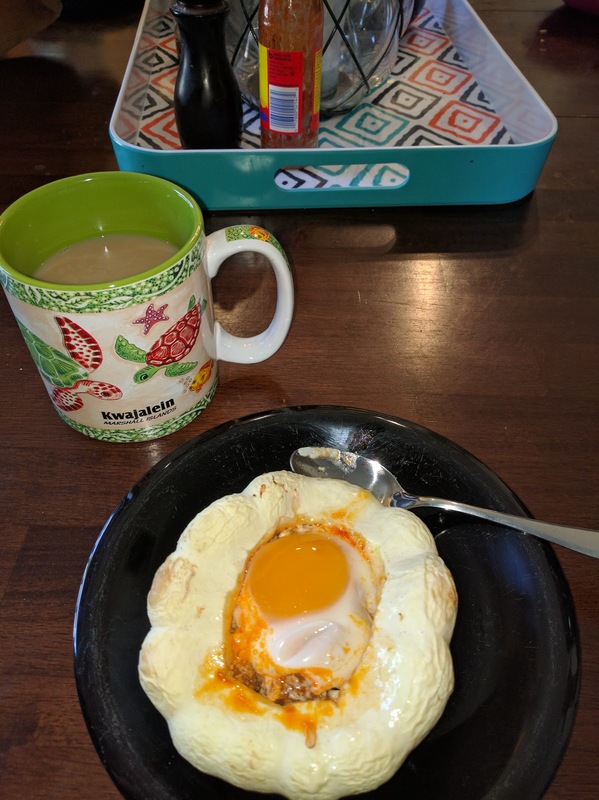 The other I made into a special breakfast treat for D and I, working from this recipe. While their recipe is for eight, obviously ours was only for two so I decreased the quantities of all the ingredients. 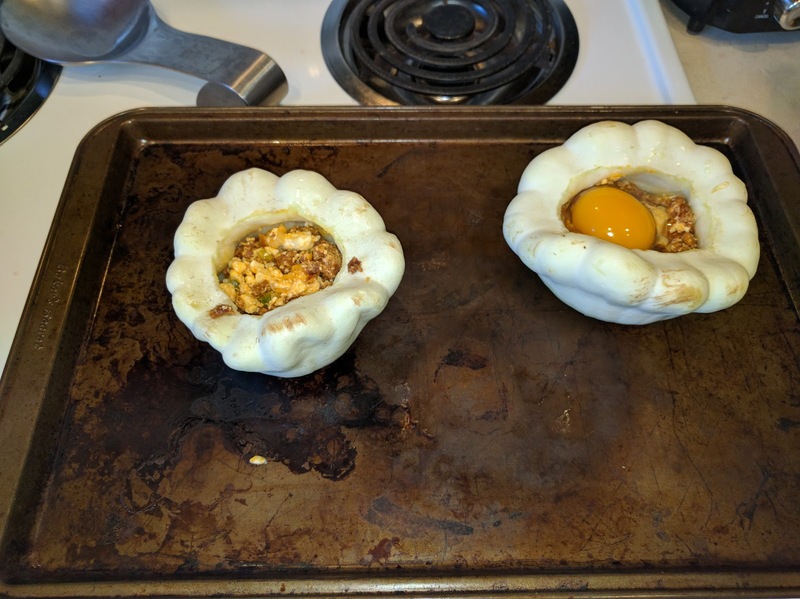 I also decided to stuff ours with a chorizo sausage, feta cheese, and green onion mixture that I warmed in the oven and spooned into the hollowed-out space in the squash before adding the egg and baking a second time. The result, a delicious and moderately healthy breakfast, perfectly portioned in it's own container! We were able to scoop out the seasoned squash flesh as we spooned up the egg and stuffing and all the flavors came together beautifully. This would be an wonderful holiday breakfast, since it's so easy to make ahead and simple to serve. Have you cooked with patty pan squash? What's your favorite recipe?